I believe one of my Paleo Diet friends posted the low-carb Lemon Garlic Shrimp over Cauliflower Mash recipe from Nancy at SheCooksHeCleans.net. Like a good husband, I asked Peggy to Pin it for me so I could make it for her. The ironic thing...it's just the opposite in our house...I cook and Peg cleans...just the way I like it. I did make the shrimp & cauliflower and we both loved it! We had tried mashed cauliflower in the past, but we weren't impressed [at least with that particular recipe]. This recipe on the other hand...is a keeper! In my adaptation of Nancy's recipe, I am simply replacing the shrimp with chicken and removing the lemon juice and red pepper flakes from the sauce. Actually the chicken you see was actually grilled the night before. Peggy is not a fan of reheated meat, but she had no problems cleaning her lunch plate. Oh yeah, word of caution, don't plan on going out after eating this, you're a walking Garlic Weapon of Mass Destruction. This gives a whole new meaning to "chemical weapon". If you are making this recipe for a gluten-free guest, please read our Guide to Gluten Cross-Contact. 1. Mix all the ingredients of marinade in a bowl large enough for all the chicken pieces. Place chicken in the bowl and make sure each one gets well coated. Cover and place in refrigerator for 1 - 4 hours. 2. Preheat oven to 400 and fire up your favorite grill (gas or charcoal). Place cauliflower and garlic cloves in foiled shallow pan [sided cookie sheet or jelly roll pan]. Drizzle enough olive oil to coat the pan/foil and the vegetables. Season to taste with salt and pepper. Cover loosely with foil and roast for 15 min. Remove foil and carefully stir vegetables so they don't stick and so they brown evenly. Uncover and roast for another 15 – 20 minutes or until cauliflower and garlic are soft and lightly browned. Remove from oven. 4. Place chicken breasts on the grill. Grill until meat is firm and juices run clear (or internal temperature reaches 165°). Remove from grill, cover allow to rest and keep warm. 5. Place cauliflower & garlic with a couple tablespoons of butter in a food processor and puree. Add parmesan cheese and mix well. The cauliflower should be a mashed potato or grits consistency (fairly thick, not runny). Add a touch cream or broth if it's too thick. Place in a heat-proof bowl and keep warm. 6. In a sauté pan, cook the bacon until crisp. Remove bacon set aside on paper towels. When cool, chop into small pieces. Set aside. 7. Add two tablespoons of butter to the bacon drippings and melt on medium heat. Add onion and cook until softened. Add minced garlic, and oregano – sauté for a minute. Stir in wine/broth. Cook until liquid is reduced by half (only a few minutes). Salt & pepper to taste. Note: I also had left over bacon, so I did not have bacon drippings to help create a sauce. So, in order to re-heat the chicken and make a sauce, in a pan melt 2 tablespoons of butter, a splash of olive oil and sauté some minced onion and garlic. After onions soften, add some gluten-free chicken stock (1/4 - 1/2 cup?). Cover just the chicken with a small cover and allowed the sauce to reduce & slightly thicken. Near the end of cooking, add some dried oregano. If I had some white wine, I would've used that instead of chicken stock. 8. 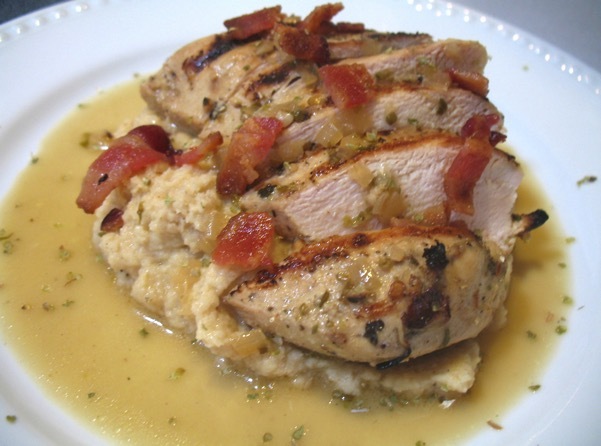 Slice chicken and place over mashed cauliflower, spoon sauce over the top. Garnish with chopped bacon. Until the next good eats - cook well and be well. During one of our trips to the Appleton Penzey's store, we ran across a new spice mixture called Tuscan Sunset. It's a great mix of basil, oregano, red bell pepper, garlic, thyme, fennel, black pepper and anise. We only purchased a small .5 oz bottle that day, but we will getting a larger bag of it. Sadly, I used it all tonight. 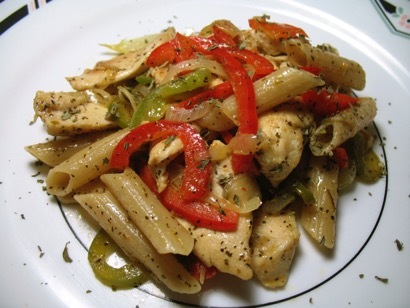 1 Package boneless skinless chicken breasts, cut in thin strips. In a bowl large enough to hold all the pasta, mix Tuscan Sunset and water, let stand 1 minute, then whisk in oil and red wine vinegar. Prepare GF pasta per directions on package. Leave it slightly al dente because it will be returned to the pan at the end. Place cooked pasta in to bowl with dressing and gently mix until pasta is coated. Let stand. Using medium heat and large deep pan saute' peppers and onion with small amount of olive oil for several minutes or until peppers have softened. Sprinkle in 1 tsp Tuscan Sunset. Salt and Pepper to taste. Remove from pan. Return pan to stove, increase heat to medium-high and allow pan to heat up without smoking. Add small amount of olive oil to pan and add chicken strips. Allow chicken to turn golden brown. Reduce heat to simmer. Sprinkle in 1 tsp Tuscan Sunset. Salt & Pepper to taste. Add lemon juice. Add in saute'ed veggies and dressed pasta. Make sure to get all the pasta dressing into the pan. Gently stir a few times until all ingredients are fully heated - about 2 - 3 minutes. Be careful not to damage the pasta. The original recipe called for asparagus tips. This is a great addition, unfortunately I did not have any handy this time. Options I want to try in the future: mushrooms and/or artichoke hearts. If you like more tanginess, add more red wine vinegar or lemon juice. The recipe is from Taste of Home's Treasury of Christmas Recipes. This is our favorite stir-fry recipe. The sauce has a perfect balance. In skillet or wok, add 3 tablespoons of broth and heat. Add chicken, stir-fry over medium heat until pink is gone (3 -5 minutes). 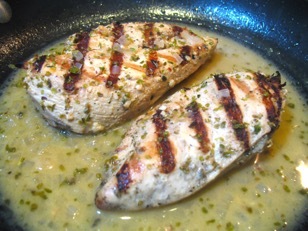 Remove chicken with slotted spoon and set aside. Add garlic, carrots & celery to pan - stir-fry for 3 minutes. Add broccoli and peas - stir-fry for 4-5 minutes - till crisp tender. Combine corn starch, soy sauce, ginger & remaining broth and mix. Cook and stir for several minutes - sauce will thicken. 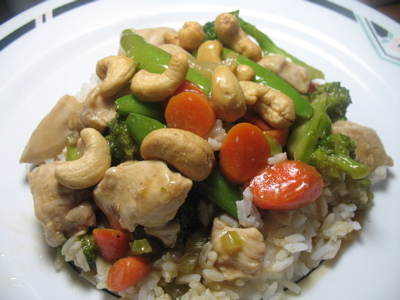 Stir in cashews or add cashews when serving. I tend to use more chicken broth than stated. We like to have a bit more sauce. © Gluten Intolerance Group of East Central Wisconsin and GIGofECW.org, 2019. Unauthorized use and/or duplication of this material without express and written permission from this site’s author and/or owner is strictly prohibited. Excerpts and links may be used, provided that full and clear credit is given to Gluten Intolerance Group of East Central Wisconsin and GIGofECW.org with appropriate and specific direction to the original content.